"Located on Merritt Island, Florida, north-northwest of Cape Canaveral on the Atlantic Ocean and 47 miles east of Orlando via the Beachline Tollway, NASA's John F. Kennedy Space Center (KSC) sits within the 140,000-acre Merritt Island National Wildlife Refuge, extending some 34 miles long and roughly 6 miles wide. 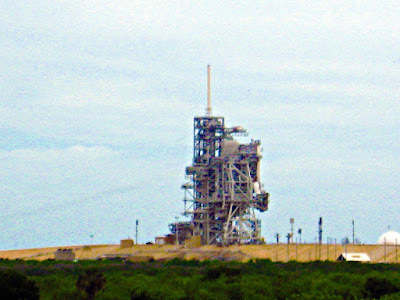 It has been the launch site for every United States human space flight since 1968 (the only place in the world where man has launched from Earth and traveled to the moon), and although such flights are currently on hiatus, KSC continues to manage and operate unmanned rocket launch facilities for America's civilian space program from three pads at the adjoining Cape Canaveral Air Force Station. 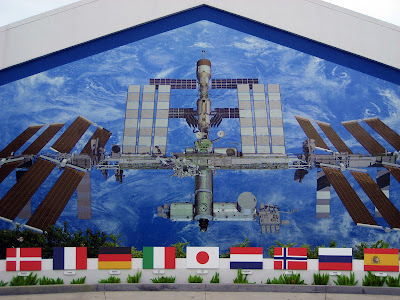 "KSC is one of ten major NASA field centers, and has several facilities listed on the National Register of Historic Places. It's home to one of the world's longest runways and the iconic Vehicle Assembly Building (VAB) - the fourth-largest structure in the world by volume (the largest when completed in 1965), and because much of the installation is a restricted area and only nine percent of the land is developed, the site also serves as an important wildlife sanctuary, where any of the approximately 13,000 workers can encounter Bald Eagles, American alligators, wild boars, Eastern Diamondback rattlesnakes, Florida panthers and Florida manatees. After stopping to pick up a couple slices of breakfast (cheese pizza, lol) and at least 3 times to pay the pesky toll fees (just barely had enough cash! 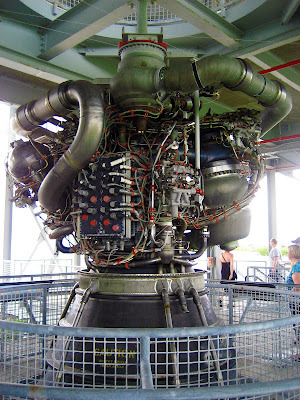 ), I arrived at the KSC Visitor Complex just as it opened at 9am, ensuring a necessary full day to experience everything. Just like Space Center Houston, all the attractions run at specific, individually-scheduled times, so after paying the $43 +tax adult admission and receiving the visitor guide and daily schedule, I carefully planned my day (with help from the information desk) before seeing anything, which is not quick thing to do, considering all the schedule overlaps. Took 6 Years and $60 Million to Simulate the Real Thing! 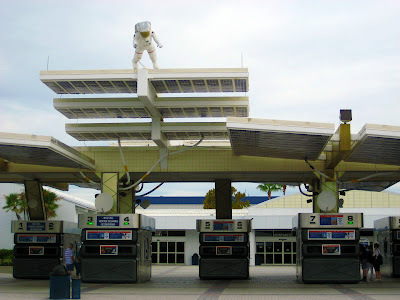 "More befitting Walt Disney World or Universal Studios (complete with the health warnings), the Shuttle Launch Experience is the center's newest and most spectacular attraction, putting guests through a simulated shuttle launch. Designed by a team of astronauts, NASA experts, and renowned attraction engineers, the the 6-story, 44,000-square-foot facility holds four simulators, each accommodating 44 people, and uses sophisticated motion-based platforms, special-effects seats, and high-fidelity visual and audio components to simulate the sensations experienced in an actual space-shuttle launch, including MaxQ, Solid Rocker Booster separation, main engine cutoff, and External Tank separation, culminating in a breathtaking view of Earth from space. Former shuttle commander and current NASA Administrator Charles F. Bolden narrates the simulation and hosts the prerecorded pre-show." (Wikipedia and Fodor's) It was really cool, and since I got there before the lines started to form, I got to stay seated for a second time! Of the Earth's 6-1/2 billion people, a mere 500 men and women (approx) have ever flown in space. But each day at KSC Visitor Complex, guests get the rare opportunity to meet veteran astronauts from NASA’s famous Astronaut Corps. I had the pleasure of listening to a 30-minute slideshow presentation from Veteran Space Shuttle Pilot, Captain Jon McBride (ret.). Recognized as one of the most skilled pilots in the country, McBride's assignments have included chase pilot for the nation's first shuttle flight, Deputy Director of NASA's aircraft operations, and capsule communicator (CAPCOM) for three separate space shuttle missions. 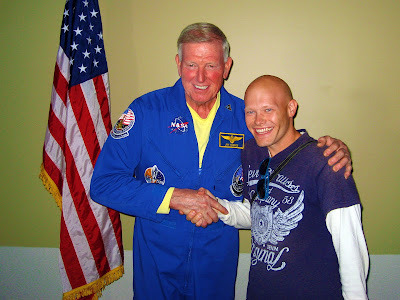 Me and Space Shuttle Astronaut, Captain Jon McBride! He was pilot of the Orbiter Challenger (mission 41-G) which launched from the Kennedy Space Center with a crew of seven in 1984. He talked about their eight day mission, assigned to deploy the Earth Radiation Budget Satellite, conduct scientific observations of the earth with the OSTA-3 pallet and Large Format Camera, and demonstrate potential satellite refueling with an EVA and associated hydrazine transfer, whatever the hell all of that means, LOL. After the Q&A I took the opportunity to meet him in the hallway and have our picture taken together; SWEET! 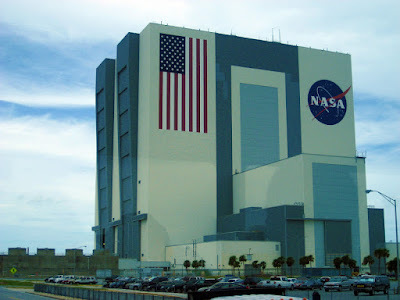 Short of becoming an astronaut, there’s no better way to get a glimpse of Kennedy Space Center than on the NASA Bus Tour (departs every 15 minutes), which stops at the LC-39 Observation Gantry for an unparalleled view of the twin space-shuttle launchpads (awesome! ), and at the Apollo/Saturn V Center to experience the historic Apollo 8 launch, marvel at a massive 363-foot-long Saturn V moon rocket, and a presentation at the Firing Room Theatre, where the launch of America's first lunar mission, 1968's Apollo VIII, is re-created with a ground-shaking, window-rattling liftoff). 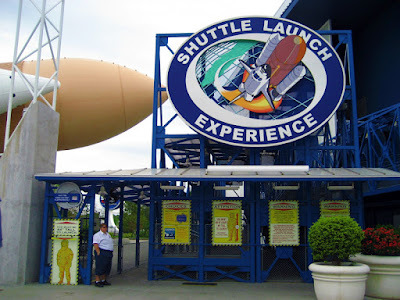 After returning from the approximately 2-hour bus tour, I walked through a full-scale "Explorer" Space Shuttle replica, I walked around the Rocket Garden, an outdoor display of eight milestone launch vehicles from KSC's history. 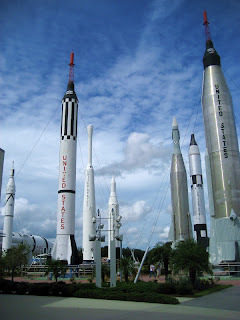 The Mercury-Redstone, Mercury-Atlas, and Titan II rockets launched astronauts and the Juno I, Juno II, Thor-Delta, and Atlas-Agena rockets launched satellites from Cape Canaveral, and the largest rocket, Saturn IB, mounted on its side, launched Apollo Command/Service Modules into Earth orbit for Apollo, Skylab, and the Apollo–Soyuz Test Project. 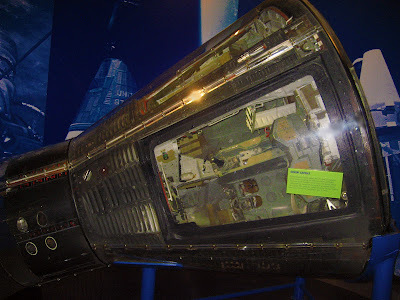 The garden also features mock-ups of Mercury, Gemini and Apollo capsules that you can get in to get an idea of the cramped quarters America's astronaut pioneers endured. 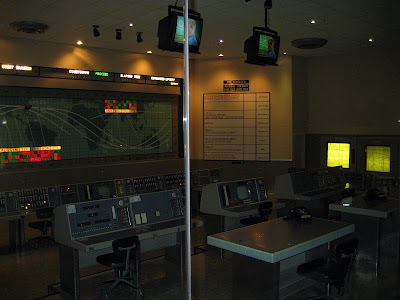 "From 1961-'65, this Very Room Served as NASA's Mission Command Center, Operated by More than Fifty People Assisting Each of the Six Missions, Successfully, with Likely Less Computing Power than Found in Your Watch! 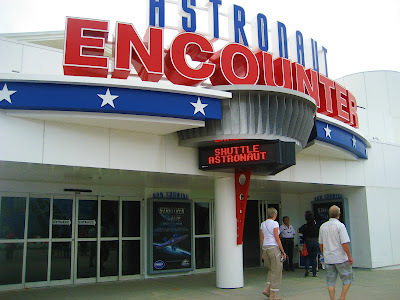 The Early Space Exploration building houses several displays of artifacts from the first manned space flights, such as the Gemini 9A spacecraft; the original Mercury mission control consoles, including furniture, from the original building at Cape Canaveral Air Force Station; and other miscellaneous memorabilia such as Star Trek costumes. 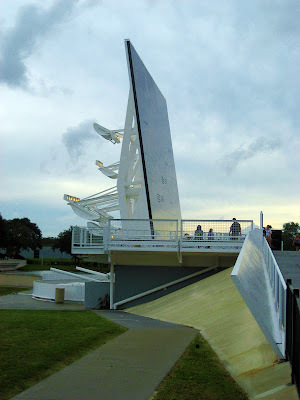 After a pretty bland, 20-minute "live mission briefing" in the Launch Status Center (both the presentation and the actual facility was much, much better at Space Center Houston), I spent some time at the Astronaut Memorial, featured primarily by a huge, 42-½ ft high by 50-ft wide, 70,400-pound polished black granite tribute to the 20 NASA astronauts who have lost their lives in the name of space exploration, as well as the names of a U.S. Air Force X-15 test pilot, a U.S. Air Force officer who died while training for a then-classified military space program, a civilian spaceflight participant who died in the Challenger disaster, and an Israeli astronaut who was killed during the Columbia disaster. The names of these 24 people are emblazoned on the monument’s surface as if to be projected into the heavens, and nearby is a granite wall bearing their pictures and brief biographies. Within Star Trek: The Exhibition, I wandered through "authentic Star Trek artifacts from the past 45 years, featuring one-of-a-kind costumes, props and filming models from every Star Trek television series and feature film. Together these components offer Star Trek fans and novices alike an opportunity to experience first-hand the imagination, artistry, technology and meticulous craftsmanship that have made Star Trek the most enduring science fiction franchise in history. Go deep within the Star Trek universe to discover the history of this ground-breaking series and a recreation of the U.S.S. Enterprise Bridge from the original series, where visitors may sit in the command chair of Star Trek’s most famous captain: James T. Kirk. 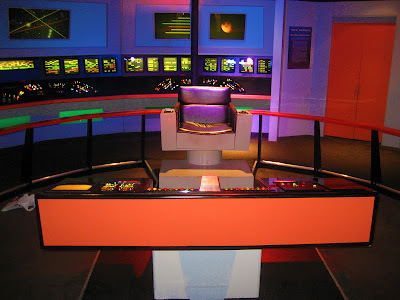 See the actual props and costumes used in the TV series’ and films, and enjoy one-of-a-kind displays, including Engineering and Sick Bay replica sets from Star Trek: The Next Generation, interactive kiosks, rare photo opportunities and unique adventures." Greetings from Mars and/or Utah! After watching a bit of Star Trek Live, "a 30-minute interactive stage show combining cutting-edge special effects, audience interaction, science and on-screen appearances from favorite Star Trek characters," which I really didn't get into, probably because it's most relevant to kids and fans young-at-heart, I strolled through the "Exploration Space: Explorers Wanted" exhibit, which contains a live theater, interactive experiences and large scale multimedia presentations to help you learn about the future of space exploration." 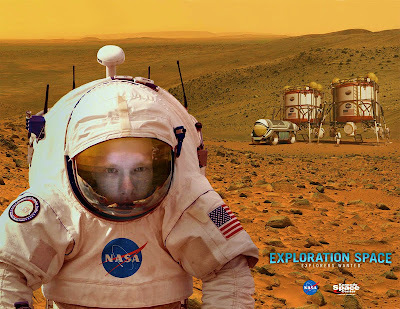 Here is where I got to take and email a couple cool pictures of myself in an animated space suit and full background via their digital photo kiosks, before hitting the road.